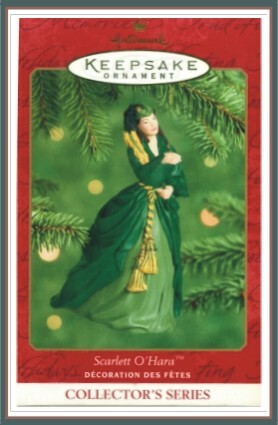 Fourth (4th) and Final in the Scarlett O'Hara - Series, the renowned Scarlett of Gone with the Wind in her Green Draperies Dress. Handcrafted - Dated 2000. Sculpted by Patricia Andrews. QX6671. When Scarlett O'Hara pays a visit to Captain Rhett Butler -- at the "horse jail" in Atlanta, she is elegantly dressed from head to toe. Never mind that her gown is fashioned from green velvet draperies or that the feathers in her bonnet are from an old rooster. Scarlett is determined to seem prosperous so Rhett will lend her the $300 she needs to pay the taxes on her beloved Tara. To complete the scene with the dashing captain, look for Hallmark Keepsake Ornament featuring the dashing Captain Butler as well as other Scarlett OHara here in our shop.